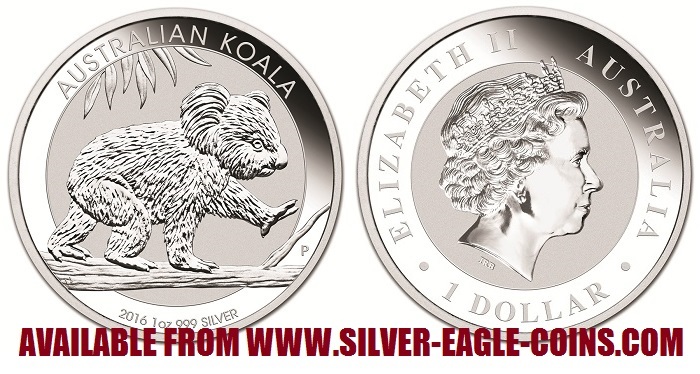 The Silver Eagle Coin Company is pleased to offer 2016 Australian Silver Koala Coins. The 2016 Silver Koala was the tenth coin issued in the popular Australian Silver Koala Series. Following the success of their other silver bullion coin series such as the Australian Kookaburras and Australian Lunar Series, the Perth Mint introduced this new silver bullion coin series in 2007, featuring their beloved koala, native only to Australia. Each coin is gem brilliant uncirculated with a gorgeous "reverse-proof" finish and is 40.6 mm in diameter. Each coin contains one ounce 0.999 pure silver, with a $1.00AUS face value per coin -- making it a "legal tender" coin in Australia. Obviously, the face value is largely symbolic since the intrinsic silver value is much greater than the face value. Each coin comes in its original Perth Mint protective plastic capsule. Buy (20) coins and you will receive an original Perth Mint sealed roll.